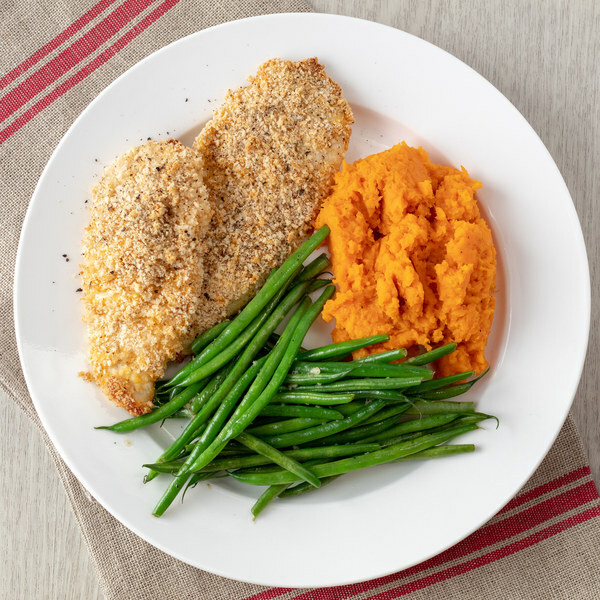 ← Almond-Crusted Chicken with Green Beans & Maple Sweet Potato Mash. When pan is hot, add almond meal and bread crumbs to dry pan. Toast, stirring often, until golden brown; about 2 minutes. Transfer the breading mix to a medium bowl and set pan aside to use later. Add salt and pepper to the bowl with the almonds and bread crumbs and stir to combine. Pat the chicken dry with paper towels and place on a cutting board. Holding a knife parallel to the cutting board, cut the chicken in half horizontally to form thin cutlets. Crack the egg into another medium bowl and beat with a whisk or fork. One piece at a time, dip chicken fillets in the beaten egg (letting the excess drip off), then in the almond mixture (pressing to adhere) and place on a parchment lined baking sheet. Cook in the center of the oven until golden brown and cooked through; about 18 minutes. Peel and cut the sweet potatoes into 1-inch cubes; transfer to a small saucepan. Add water to the saucepan, covering the potatoes, cover with a lid, and bring to a boil. Reduce heat to medium-low and cook until they are tender when pierced with a fork, 8-10 minutes. Trim and discard the ends of the green beans. Once the potatoes are tender, remove from heat, carefully scoop out ½ cup of the water and set aside. Drain the potatoes in a colander and return them back to the saucepan. Add maple syrup, butter, salt, pepper and the reserved cooking water (if needed) to the potatoes; mash with a potato masher (or fork) until smooth. To serve, divide the almond-crusted chicken, green beans, and maple mash between plates. Enjoy!